The firm ground boot was perceived to be comfortable by a majority of the users. Many players liked the style of the boot and described it as “smart-looking”. Several players were impressed with the performance of the Adidas Predator 18.2 Firm Ground on the pitch. A lot of users felt that the firm ground boot is worth the money despite its slightly expensive price. The firm ground boot was especially loved by parents for their sons due to its overall quality. Some players think that the Predator 18.2 FG is an exceptional boot for a takedown model. Many users think that the Primemesh upper is as equally impressive with the more expensive Predator 18+ FG. Some players felt that the boot was too tight when they initially wore it. The heel construction of the Adidas Predator 18.2 FG lacks lockdown according to a reviewer. A few of the users felt that the heel area was too tight. One of the players shared his disappointment with the apparent disparity between the original Predator boots and the Predator 18.2 FG. The outsole of the boot was described by one of the reviewers as chunky in comparison to the high-end models. The Predator 18.2 Firm Ground (FG) is criticized for its contemporary look and feel that significantly differ from those of the original Predators.. However, the majority have agreed that it is yet the best takedown model Adidas has produced. Its overall quality and tech specs were highly praised by many that even parents highly recommend them. I think a lot of people would expect for the quality materials would just plummet compared to the higher-end models and sure, it's nowhere nearly as nice but I actually reckon you get a pretty decent feel with this predator but the reason is the Controlskin. When I saw the Predator 18.2 was gonna be $140, I immediately thought that was too expensive. Now that I have them in my hands and I've had the opportunity to try them out, I have to say that the actual quality of the shoe is justified. A lot of useful similarities have been observed with features of the takedown models of the Predator series particularly with the Predator 18.1 FG and Predator 18.2 FG. For one, their upper is coated with a layer of Controlskin that is intended to enhance ball sensation. Another apparent resemblance is the stylish ridges that are carved on the toe area and the sides. The texture is formed by a mesh-based synthetic material called Primemesh. It provides a snug fit that anatomically follows the shape of the foot. The Adidas Predator 18.2 FG is styled with a mid top collar that has a stretchable Neoprene quality. It wraps the foot snugly, alongside with the central lacing system, through a supportive fit. At a glance, the outsole of the firm ground boot is closely identical to the high-end silo, Predator 18+ FG. It is made from a TPU (Thermoplastic Polyurethane) material that enhances the soleplate durability. The studs are uniquely shaped to produce hybrid traction. It is designed to flexibly result in an agile change of directions and stability on firm ground. The heel has a molded construction with an internal counter. The Adidas Predator 18.2 firm ground boot provides true-to-size measurements. The fit can be adjusted through a lace-up enclosure. The sock extension conforms to the shape of the foot with its elastic quality. The football boot can be purchased in men’s version in standard sizes. The TPU-injected outsole of the Adidas Predator 18.2 FG leads to a more stabilized sensation in the foot particularly from the midfoot to the heel area while the forefoot area offers a more flexible construction. The stud pattern is identical to the high-end models of the Predator line. Seven hybrid studs line up the toe area while four are positioned in the heels to amplify support. The shapes of the studs resemble irregularly shaped diamonds. The studs are versatile enough to be engineered for both rotational and traction movements. A synthetic mesh material makes up the upper of the Adidas Predator 18.2 FG. It is a less premium material than PrimeKnit but offers a structured construction that is designed to produce a foot-hugging sensation. It has a thicker yet more stable composition that helps in ball control. The mid top collar is made from an elastic Neoprene material. The texture of the collar is similar to the Adidas X 16.3. It extends from the ankles to the forefoot to mimic the sensation of a sock. It aids in the overall lockdown of the boot. The overall style of the boot is not necessarily the traditional Predator character. However certain design features such as the heritage black, red and gold combination, the classic white stripes and the ridged upper are derived from of the iconic lineup. The signature Predator and the Adidas logos are emblazoned in the heel area while the Adidas stripes are printed on the lateral side. The Adidas 18.2 FG features a lace-up enclosure that is positioned above the sock-like extension. 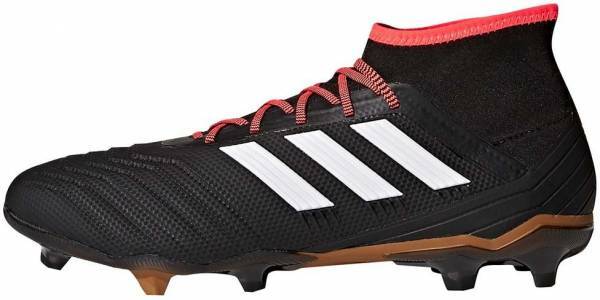 The boot weighs approximately 270 grams which is an ounce heavier than Adidas Predator 18.1 FG. The Adidas Predator 18.2 Firm Ground is available in the Skystalker Pack Colorway featuring these three colors: Core Black-Running White-Infrared. Another firm ground variation from this collection is the Predator 18.1 Firm Ground.